The purpose of KAY Leadership Camp (KLC) is to develop leadership potential, to enrich personalities, to create an awareness of citizenship responsibilities and to develop a desire to become involved in those programs and projects which help to build a better world. KAY camps have been rated by several national groups as one of the finest leadership training programs in the nation. A wide variety of activities take place during the week: Team Meetings (brainstorming skills, designing & presenting a project, serving a camp meal, etc. ); Creative Period Sessions (creating/contributing to a camp activity); Leadership Labs (understanding techniques and responsibilities, sharing ideas); Dreamweaver Sessions (presentations on special interest topics); etc., In addition, each day offers several recreational activities (aerobics, archery & rifle range, basketball, canoeing, crafts, dance, games, horseback riding, swimming, volleyball, etc.). Capable instructors are provided for all recreational activities. An optional all-camp swim is available each day as is free time. The finale of each day is an evening program presented by dynamic speakers and participating campers. Following Wednesday evening team presentations, a "Music by Moonlight" celebration/dance takes place at the pool. The last night of camp includes a banquet and traditional campfire. From daily flag raising and lowering time, to table manners, staff morning reports and camp-wide service project, KLC provides campers with motivation and enthusiasm for a super fantastic year as well as friendships and memories for a lifetime. Any KAY member (boy or girl, grades 6-12) wishing to attend may do so with their sponsors approval. IT IS HIGHLY RECOMMENDED THAT THE CLUB PRESIDENT ATTEND CAMP. There is no limit on the number of students that can represent their club at camp, and camp delegates do not have to be an officer or board member in their club. KAY Leadership Camp is held at the Rock Springs 4-H Center. Rock Springs is located eight miles south of Junction City on U.S. Highway 77 and four miles west on Kansas Highway 157. The fee for the 2019 camp will be $315 per camp delegate. Registration will be done online using the Sponsor/School password. This includes signing up for recreation & select activities. Campers will fill out registration card and give to KAY Sponsor who will complete registration online. PLEASE NOTE REGISTRATION DATE MAY 1! Once campers are entered online, sponsors will receive an invoice for the amount of money due. NOTE: Please register students who are committed to attend KLC. In 2018, we maxed out our registration number of 286 and other interested campers were turned away. We will keep a waiting list, however it is expected that those who register will indeed attend camp. 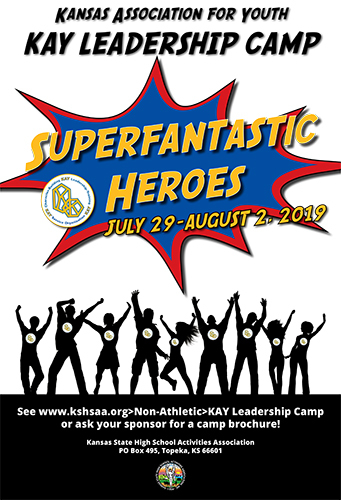 ALL KAY LEADERSHIP CAMP DELEGATES MUST COMPLETE & SUBMIT A ROCK SPRINGS YOUTH HEALTH & PARTICIPATION FORM. Once your invoice is received, please submit a copy with your payment. Credit card payments are not accepted. Make checks payable to KSHSAA ($315 per camper). NOTE to experienced sponsors â€“ KSHSAA Form KAY-4 (HS)/KAY-4J (MS) no longer exists. Camper Check-In: Monday, July 29, 2019 - 12 p.m. Camper Check-Out: Friday, August 2, 2019 - 11 a.m.